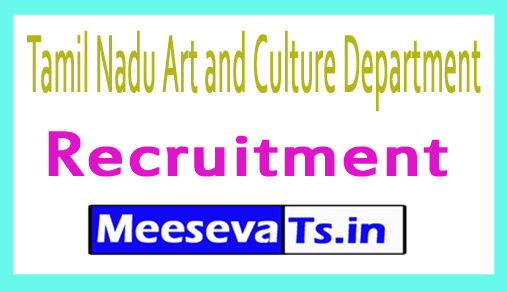 Tamil Nadu Art and Culture Department Recruitment 2018: Tamil Nadu Art and Culture Department has published the official announcement of the 23 vacancies of Professor of Music. Eligible and trained candidates can submit the 2018 application form from the Tamil Nadu Arts and Culture Department in offline mode from their official website at artandculture.tn.gov.in. Interested candidates can apply until the last date, 20.07.2018, for the position of music teacher of the Department of Art and Culture of TN 2018. Applicants can download the official notification from the official website before requesting this job. For more information on the Department of Art and Culture of Tamil Nadu, the qualification details are included, such as educational achievement, age limit, selection process, application fee and how to submit the application, important links, syllabus. , Tickets, results, previous documents. Interested and eligible applicants may download the prescribed form from the artandculture.tn.gov.in website and submit their application from 20.07.2018. The prescribed format should be sent along with the photocopy of all relevant documents to the address below.